LaViolette first presented evidence for his theory in his 1983 Ph.D. dissertation which he worked on at Port land State University in Oregon. Astronomical evidence he had gathered indicated that every 10,000 years or so intense volleys of cosmic ray electrons are unleashed from outbursts of our Galaxy’s core and make their way to us traveling at close to the speed of light. Further he reasoned that one such “Galactic superwave” had bombarded our solar system near the end of the ice age causing large quantities of cometary dust to enter the solar system a long with an increased influx of meteors and comets. 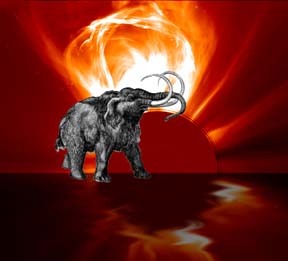 He proposed that this triggered a sequence of events including the occurrence of super-sized solar flare outbursts that led to the extinction of the large mammals 13 thousand years ago. He postulated that these superwave cosmic rays created a sheath of radiation around the solar system hot enough to vapo rize the surface of orbiting comets and fill the solar system with a dense cloud of cosmic dust. He theorized that the process also would have fragmented some comets and sent large chunks, some of comet size, careening into the inner solar system. He proposed that the presence of this dust had affected the Earth’s climate and aggravated the Sun, causing it to create giant solar flares. During this extended two millennium period, he says, Pleistocene megafauna were being plagued by elevated UV radiation and catastrophic floods of glacial meltwater discharged from the surface of the ice sheets. He proposed that at least one giant-sized solar coronal mass ejection may have been strong enough to overpower the Earth’s geomagnetic shield and scorch the Earth, thus creating the final chapter in the decimation of the megafauna whose remains in some cases are found to have abnormally young radiocarbon dates. He elaborates on this in his book Earth Under Fire as well as in various journal papers. LaViolette apparently is on the right track since data that later came out showed that atmospheric radiocarbon experienced an anomalous 7 percent increase over the period spanning the Younger Dryas transition boundary. In the early 80’s, as a key test of his theory, LaViolette had analyzed samples of polar ice for the presence of iridium and nickel. He found that on at least six occasions during the mid and early stages of the last ice age cosmic dust incursion episodes had occurred. His theory predicted that he should also find high concentrations of cosmic dust during the interval from 11,000 to 14,000 years ago that spanned the extinction of the large Pleistocene mammals. But at that time he was unable to complete this crucial test of his theory because of lack of available ice samples spanning this interval. At that time, LaViolette’s findings were considered quite novel, particularly his discovery that certain ice age polar ice samples contained high levels of tin along with iridium and nickel, for such high tin concentrations had never before been seen in extraterrestrial material. Now, however, a group of 26 scientists, led by Lawrence Berkeley Lab scientist Richard Firestone and geologist Alan West, has found evidence that high levels of extraterrestrial material are present at the 12,900 year old Younger Dryas mass extinction boundary, thus confirming LaViolette’s 24 year old prediction. As described in their paper in the October 9th issue of the Proceedings of the National Academy of Sciences, the Firestone- West “Younger Dryas boundary (YDB) group” found high concentrations of iridium, nickel, tektites, fullerenes, nanodiamonds, and helium-3 at this boundary, a date that also marked the end of the two-millennium-long megafaunal extinction episode (Firestone, et al., 2007). In particular, part of the YDB group (Darrah, et al., 1977) reported that magnetic separates from the YD boundary contained high levels of tin and copper, thereby corroborating LaViolette’s earlier conclusion that the tin he had found was of cometary dust origin and evidence of a past superwave passage. Firestone et al. propose that a comet at least several kilometers in diameter had impacted the North American ice sheet or fragmented and exploded in the atmosphere and that its fireball induced a global firestorm followed by glacial meltwater flooding. They propose that these events together with the initial shock wave and release of noxious gases were a chief cause of the megafaunal extinction. LaViolette’s prediction that high concentrations of cosmic dust should be found in the interval spanning the 13 thousand year old Younger Dryas transition boundary emphasized more the idea of enhanced cometary dust deposition, although the notion of a comet impact occurring at this time is also compatible with his theory which projected an increased influx of comets and meteors during this time. However, LaViolette believes that the comet impact was not a main cause of the extinction. His theory proposed a more extended die-off episode climaxing with a particul arly large solar flare and associated episodes of global conflagration and glacial meltwater flooding. This scenario later received strong support from discoveries that this period was marked by a 700 year rise in radiocarbon concentration, an indicator of elevated solar activity, as well as by an extended increase in atmospheric beryllium-10 production, an indicator that Galactic cosmic ray intensity had been elevated at that time. LaViolette points out that a Younger Dryas boundary comet impact does not account for such effects. Their proposed supernova has insufficient material to form their proposed comet, falling short by a factor of 100 million even for an impact by even a modest sized 1 kilometer diameter comet. A 12,900 year old comet explosion/impact cannot account for the finding that the death rate of these extinct mammals began to rise 2000 years before this comet impact date nor can it account for the increase in atmospheric C-14 concentration which began rising 500 years prior to this date. Their proposal that the comet should have entered the solar system at one percent of the speed of light, a hundred times faster than most comets, is extremely problematic. A comet traveling at such a high speed would impacted with far too much energy. For example an impact by a 480 km comet, a size Firestone and West suggest in their book, would have released an energy equivalent to a trillion megatons of TNT, instantly turning our atmosphere into a plasma. The Earth would have no atmosphere today if this were true. Middle-aged supernova remnant shells (7000 to 28,000 years old) have not been observed to expand at the enormous speeds they propose (e.g., 10,000 to 2,500 kilometers per second), nor is there any evidence of such a high velocity shell being present in the Sun’s vicinity. Hot supernova gases cannot condense into frozen cometary bodies in just 28,000 years, nor into hypervelocity iron grains in just 7,000 years, as Firestone and West have claimed. Their proposal that iron grains were traveling at 3 percent of the speed of light and pelted 34,000 year old mammoth tusks is seriously flawed. If they were traveling at this speed, such hypervelocity particles would have completely vaporized before reaching the Earth’s surface. Also the quantity of ferrous metals that a supernova at this distance would have been able to shower on the Earth falls short by at least 100,000 fold. Their claim that the 40,000 year old peak in beryllium-10 concentration seen in the polar ice record was produced by their proposed 41,000 year old supernova explosion is problematic. Be-10 begins its rise several thousand years prior to their proposed date and spans a total of 6000 to 7000 years. A supernova gamma ray flash by contrast should have produced a spike lasting just two years. The same time mismatch is seen in the radiocarbon record for this period. Supernova explosions do not occur frequently enough to explain the more than a dozen beryllium-10 peaks seen in the polar ice record, eight of which precede Firestone-West’s proposed supernova date. On the other hand, such frequently occurring peaks are expected on the basis of the superwave theory, which predicted their existence before the Be-10 data was even published. Supernova explosions do not occur frequently enough to explain the numerous cosmic dust peaks seen in the polar ice record. However, superwaves do occur frequently enough. Some of the YDB group collaborators also have reservations with Firestone and West’s supernova theory. One is anthropologist William Topping who had coauthored a paper with Firestone in 2001 in the Mammoth Trumpet. Topping had studied YD boundary PaleoIndian artifacts during the 1990’s and, like LaViolette before him, had concluded that a giant solar coronal mass ejection must have been a key factor responsible for the demise of the megafauna as well as for the disappearance of the Clovis mammoth hunters. Darrah, T H, et al. “Mineralogical and noble gas evidence for an ET impact at the Younger Dryas.” Paper PP41A-04, May 2007 AGU Conference, Acapulco, Mexico. Firestone, R. and Topping, W. “Terrestrial evidence of a nuclear catastrophe in Paleoindian times.” Mammoth Trumpet 16(2) March 2001, pp. 9 – 16. Firestone, R. West, A., and Warwick-Smith, S. The Cycle of Cosmic Catastrophes. Rochester, VT, Bear & Co., 2006. Firestone, R. B., et al. “Evidence for an extraterrestrial impact 12,900 years ago that contributed to the megafaunal extinctions and Younger Dryas cooling.” Proceedings of the National Academy of Sciences 104, October 9, 2007c, 16,016 -16,021. LaViolette, P. A. Galactic Explosions, Cosmic Dust Invasions, and Climatic Change. PhD dissertation, Portland State Univ., (1983a) Portland, Oregon, pp. 763 (Univ. Micro. No. 83-24,329); [https://adsabs.harvard.edu/abs/1983PhDT………9L] Later published as Galactic Superwaves and Their Impact on the Earth Environment (includes more recent supporting evidence being added between 1994 and 2007). LaViolette, P. A. “The terminal Pleistocene cosmic event: Evidence for recent incursion of nebular material into the solar system.” (abs.) Eos 64, p. 286; Spring AGU meeting, Baltimore, May 1983b. “Elev ated concentrations of cosmic dust in Wisconsin stage polar i ce.” (abs.) Meteoritics 18, p. 336; 46th meeting of the Meteorit ical Society, Mainz, September 1983c. “Galactic superwaves and their effect on the Earth and Solar System.” (abs.) Presented at the Galaxy and Solar System Conference, Tucson, Jan. 1985a. “The cometary break-up hypothesis re-examined.” Monthly Notices Royal Astronomical Society 224 (1987b): 945-951. “Regarding the validity of polar trace metal data: A response.” Monthly Notices of the Royal Astronomical Society 233 (1988): 221-224. “Galactic core explosions and the evolution of life.” Anthropos 12, 1990, pp. 239 – 255. “Anticipation of the Ulysses interstellar dust findings.” Eos 74(44) (19 93): 510-11. Earth Under Fire. Rochester, VT: Bear and Co., 1997, 2005a. “A galactic superwave hazard alert.” Nexus 8(2) February – March 2001, pp. LBNL, “Supernova may have caused mammoth extinction.” Sept. 23, 2005 Lawrence Berkeley National Laboratory press release, September 23, 2005.